The other day I ventured over to the mall to try out a new snack from Auntie Anne’s called the Bacon Cheddar Stuffed Pretzel Nuggets. I had my family with me, so this review isn’t just my own, but also my wife and kids, of whom I made sure to document their very serious feedback. The Bacon Cheddar Stuffed Pretzel Nuggets are unlike anything I’ve seen from Auntie Anne’s, as there are really just bite sized pretzels filled with cheese and bacon. All in all, though, they are pretty fantastic. They come in a large cup with about 12 pieces for a retail price of about $5. The outside pretzel crust had a nice crisp to it. 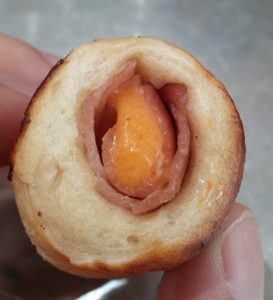 It was a typical pretzel texture that was warm and chewy on the inside. It didn’t know for certain, but it tasted like both the outside and inside of the bread was coated with a butter glaze. The actual bread flavor was a bit more bread-like than pretzel-like. I didn’t get a strong pretzel flavor, but that almost might have been the other, more power ingredients pushing that flavor aside. 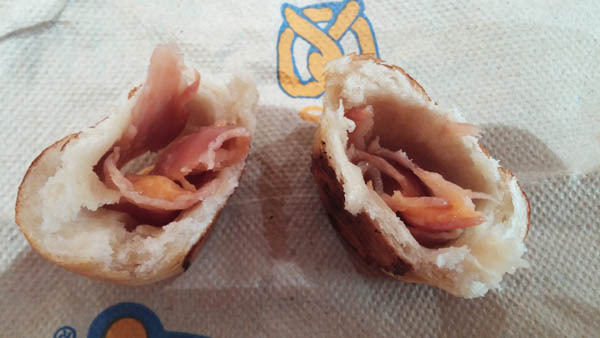 Stuffed inside the pretzel is a piece of bacon and piece of melted cheddar cheese. 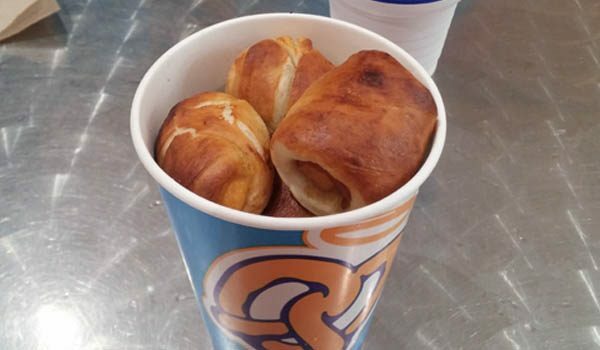 They were the real heroes of the Pretzel Nuggets. 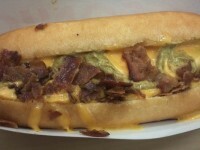 The bacon was cooked so a soft texture (not crunchy), and they used real cheddar cheese that was at a perfect level of melt. The cheese isn’t oozing out, but it definitely isn’t hard. The entire flavor profile was very complementary, where everything really went well together. I have mentioned on this blog previously how I think the bacon/cheddar cheese flavors are really under-utilized. 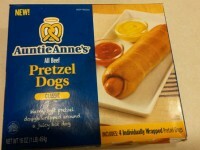 Auntie Anne’s really steps up here and gives us a great bacon/cheddar combo wrapped in a buttery bread. The Bacon Cheddar Stuffed Pretzel Nuggets could have had a perfect 5/5, however the only thing against them was the price, which I felt was a little higher than it could have been (I’d like to see it in the 3.99 range). Maybe I am just too cheap. They were definitely delicious, and my kids couldn’t get enough of them. 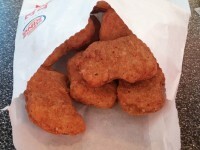 Unfortunately the Pretzel Nuggets are only going to be around through the rest of the summer. Hopefully they will come back soon.